Calm and confident brush strokes sweep over each canvas in a selection of abstract paintings by Christopher Engel. 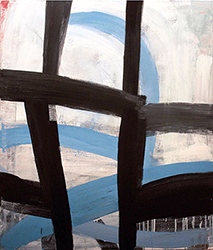 His work vibrates with the energy of bold, gestural lines that intersect at points between the foreground and background. These fields are bridged together in a web of kinetic, interconnecting lines which create a remarkable sense of three dimensionality. The close examination of space, or how we create it and replenish a void, is a study that Engel has pursued since he started as a landscape painter in the early 70s. “I was deeply affected by the relationship between the elements of the landscape; trees, shrubs, bushes, and elements on the periphery,” he states, “everything worked to define the space that contained and moved me.” Engel currently works out of a studio near Roxbury, NY, where a pellet stove warms the high ceilings and sunlight penetrates through sky-lights. Nestled in the Catskill mountains, he continues to honor the influence of the natural landscape and remain enamored by the impact of color. With several canvases standing over four feet tall, the surfaces are rich in a sophisticated palette of earth tones; greens, browns, blacks, blues and occasional use of bright red and orange allude to an aesthetic that straddles both landscape and abstraction. Yet despite representational titles such as “Canyon,” Ice Storm”, and “Clear Skies”, Engel’s vision immerses the viewer in suggestions of horizon lines or tree branches rather than orient them directly toward a conventional depiction. Tensions of push and pull are achieved with both opacity and transparency, as well as the natural flow of the medium. Ultimately, the point of departure is radically transformed and the end result is nothing short of powerful. Carrie Haddad Gallery welcomes back sculptor Dai Ban and a new series of minimalist sculpture, completely reinvented from his signature bronze casts of playful animal figurines. In the process of breaking down the representative form, Ban has traded clay and bronze for simple planes of precision board, styrofoam and venetian plaster. His new choice of materials serve to maintain the lighthearted nature found in the core of his work through the effects of shifting light on color and shadow over various heightened surfaces. Each piece's title, color and position of conjoining planes hints at a subtle story or moment of existence. “Sunsets”, for example, portrays the passage of time with a brilliant blood-orange, changing tone over contrasting levels, alluding to the fading daytime sky. Dai Ban was born in Japan and later studied fine art and sculpture at Tokyo's Musashino Art University. He moved to the United States in 1985 and settled in the Berkshires via New York City, where he now lives and works. Scott Nelson Foster is perhaps best known for his black and white, monochromatic photo realist scenes of neighborhoods in small town America. Perfectly straight lines provide a stunning depth of perception, while calculated detail resemble that of a drawing or photograph. Foster does all of this and more, and he does it with watercolor; a medium so fluid and unforgiving that working on any surface larger than 9 x 12 inches becomes a physical test of the nerves. Foster’s previous depiction of suburban landscapes and city vignettes avoided the particular, shunning unique detail so the narratives spoke to a universal aesthetic. These scenes shared a certain passing of time, devoid of human life, and shaped the artist’s personal definition of beauty discovered in “absence and loss, not presence.” He relishes in the anonymity behind Mexican Grocery that is placed in “Anywhere USA”. In more recent paintings from 2015, however, the work takes a turn as his titles begin to name specific street corners in cities of the Capital Region of New York State. King Street, Troy illustrates an iconic intersection in Troy, NY – a city well known for its historic architecture and ever popular Saturday morning waterfront farmer’s market. For the first time, Foster allows small details to enter his paintings that place them in a certain time and place. Time and place once again intersect in a much more tangible way. The artist received his MFA in Painting and Drawing from Utah State University and currently paints and teaches at Siena College in Albany, NY. Artist Paul Chojnowski is well known for his “fire drawings” of nocturnal cityscapes for which a blow torch is used to burn images into water soaked paper. He is is no stranger to experimentation and continues to push the limits of nontraditional media. “Paper, Plywood and Light”, introduces a fresh presentation of Chojnowski’s drawings, both in a series of Light Boxes and new works on rough cut plywood. The Light Boxes consist of smaller drawings suspended in mahogany boxes and back lit by LED lights. The glowing effects of a twinkling chandelier or illuminated skyscraper are heightened as they will be exhibited in a darkened gallery. Chojnowski introduces new imagery in the Light Boxes with the Cosmos Series, a group of “astronomical abstractions” in which he has introduced color to an otherwise dark palette. “Conceptually, it was a natural progression for me to enhance the illusion of light in my work,” says the artist. The new fire drawings on B/C grade plywood are burned, scorched, sanded and carved. Unlike his earlier work on fine grained Baltic birch plywood, these works begin with an image as a point of departure and then push the boundaries of his unique drawing process toward a more abstract end.